Videos of the first two project webinars are now available on YouTube. The series kicked off Nov. 6 with a detailed discussions of the demographics of small systems and the issues they face. The webinar features presentations by Joy Barrett and Bill Hogrewe of the Rural Community Assistance Partnership. DeRISK and WINSSS staff again came together earlier this month to hear from University of Illinois' Steve Wilson about the results of a state survey designed to improve understanding of treatment technology adoption. Results will serve as the foundation for efforts to document additional data needs, help interested states overcome barriers to adoption, and develop approaches to facilitate further acceptance. 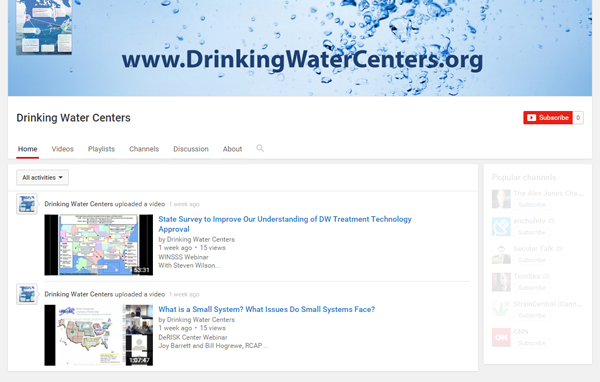 You can view these and future webinars on the Drinking Water Centers YouTube page. Links to PowerPoint presentations are included in the video descriptions. A listing of webinars, symposia, and conferences relevant to this work. Researchers, practitioners, and utilities will explore the latest developments in biotreatment technology, operations, and monitoring strategies. This annual event provides water treatment industry professionals with information on innovative technologies and connects them with training and networking opportunities. Why it's interesting: This case study in a small Iowa community documents the effectiveness of a biological treatment system designed to remove ammonia in source water, thereby preventing nitrification in the distribution system. Simeonidis, K., Kaprara, E., Samaras, T., Angelakeris, M., Pliatsikas, N., Vourlias, G., Mitrakas, M., & Andritsos, N. (2015). Optimizing magnetic nanoparticles for drinking water technology: The case of Cr(VI). Science of the Total Environment, 535, 61-68. doi: 10.1016/j.scitotenv.2015.04.033. Why it's interesting: California recently lowered their Hexavalent chromium maximum level to 10 μg/L, and other states and countries are expected to re-evaluate regulation limits in the near future. This study examines the potential use of magnetite nanoparticals as a cost-effective solution to the efficient treatment of Cr(VI). Jensen, V. B. (2015). Nitrate in potable water supplies: Treatment options, incidence of occurrence, and brine waste management (Order No. 3723643). Available from ProQuest Dissertations & Theses Full Text; ProQuest Dissertations & Theses Global. (1728883302). Why it's interesting: Small water systems are particularly affected by the high costs of treating source water with high nitrate levels. This University of California, Davis dissertation examines the feasibility of four brine disposal options for small systems and recommends a regional approach to overcome high disposal costs. Wedgeworth, J.C., Brown, J, Olson, J.B., Johnson, P., Elliott, M., Grammer, P., & Stauber, C.E. (2015). Temporal heterogeneity of water quality in rural Alabama water supplies. Journal of the American Water Works Association, 107(8), E401-E-415. doi: 10.5942/jawwa.2015.107.0098. Why it's interesting: Because microbial risk assessments impact how water is treated, it is important that those assessments be accurate. This analysis of trends in key water quality measures in rural water systems indicates that sampling efforts used to create risk assessments must account for indicator variability over time. Researchers at the National University of Singapore have developed a novel biomimetic membrane that purifies water at low pressure. A new floating solar power plant in Holtville is expected to reduce evaporation of the town's drinking water supply and decrease reliance on chemicals to treat the water. A new center at the University of Arizona will help researchers, public officials, and industry leaders work together to develop new, sustainable technologies, including new treatment solutions, with the goal of addressing water scarcity. The University of Alabama is testing a method of cleaning drinking water with light with the hope of creating a product for homes and businesses. The two National Centers for Innovation in Small Drinking Water Systems, based at the University of Colorado - Boulder and the University of Massachusetts - Amherst, are collaborative research groups charged with examining and reducing the barriers of innovative treatment technology implementation at small drinking water systems. The funding for the centers comes from the U.S. Environmental Protection Agency as part of its Science to Achieve Results (STAR) program. Copyright © 2015 WaterOperator.org, All rights reserved.